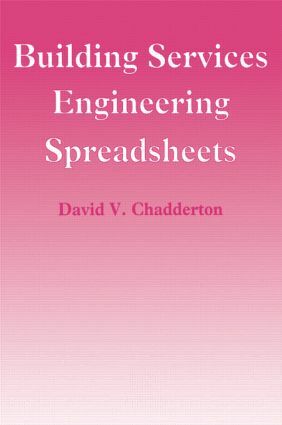 Building Services Engineering Spreadsheets is a versatile, user friendly tool for design calculations. Spreadsheet application software is readily understandable since each formula is readable in the location where it is used. Each step in the development of these engineering solutions is fully explained. The book provides study material in building services engineering and will be valuable both to the student and to the practising engineer. It deals with spreadsheet use, thermal transmittance, building heat loss and heat gain, combustion analysis, fan selection, air duct design, water pipe sizing, lumen lighting design, electrical cable sizing, at a suitable level for practical design work. Commercially available software, while very powerful and comprehensive, does not allow the user any facility to look into the coded instructions. The user has to rely upon the supplier for explanation, updates and corrections. The advantage that the spreadsheet applications provided with the book have over purchased dedicated software, is that the user can inspect everything that the program undertakes. Parts of the worksheets can be copied to other cells in order to expand the size of each worksheet. Experienced spreadsheet operators can edit the cells to change the way in which data and calculations are used, and with guidance from the explanatory, build their own applications.